First of all a quick shot or two of Miss 6 in today’s thrift shop finds (top with cherry embroidery, handmade plaid shorts with lac?e trim, and red hair rollers-all $2 each) – The rollers area bit sticky, so what else do you do with them! On 11 February 1942 a German Kriegsmarine squadron left Brittany at 21:15 and escaped detection for more than 12 hours, sailing past the Straits of Dover, and finally being discovered when they entered the North Sea. There they were attacked by the British armed forces including the Royal Air Force, the Fleet Air Arm and Coastal Artillery, but the attacks were unsuccessful. By 13 February all the Kriegsmarine's ships had reached their home bases in Germany, making sure that the ‘Channel Dash’ (codenamed Operation Cerberus by the Germans) would be remembered for all time. Don’t they look so cute? And totally masculine. 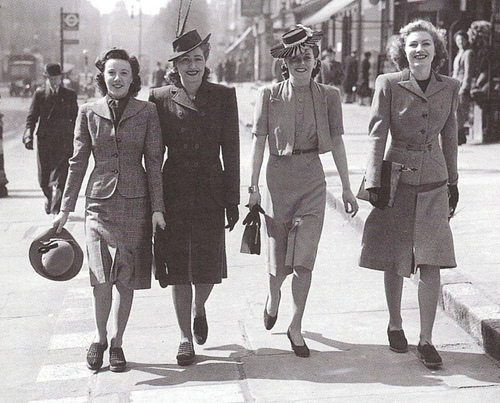 We know that during WWII women had to do their bit. Not only at home, but by joining up or working in factories, such as those that produced uniforms, bombs, ammunition and even aircraft. There were many propaganda posters urging women to get involved in factory work. And for those already working, there were posters to encourage the right type of clothing. 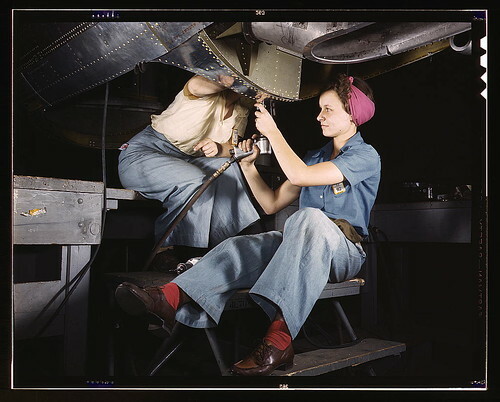 Of course hair had to be tied back, or even better hidden under a scarf, Rosie riveter style. As I have mentioned in a previous post, actress Veronica Lake even made a propaganda movie about tying back her hair for the war effort. And overalls or siren suits were also worn. Simple, sturdy, and affordable shoes were needed. Low heeled Oxford shoes, sometimes with the two toned black and white or brown and white design or as above in two different materials, were popular, as were loafers (se below). They were even worn with skirts, often with low white socks. They laced up and so supported the foot, making them ideal for everyday wear. 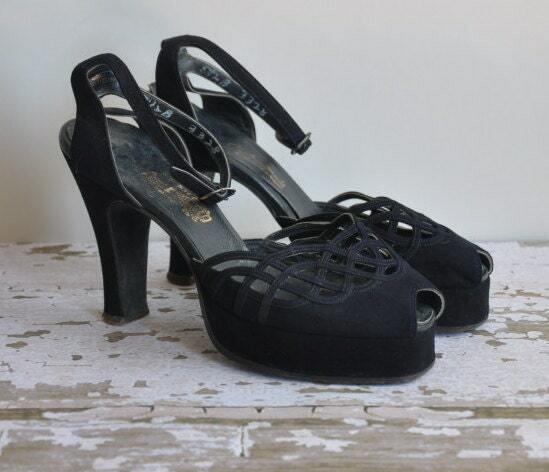 Low heeled Mary Jane style shoes were also a staple. 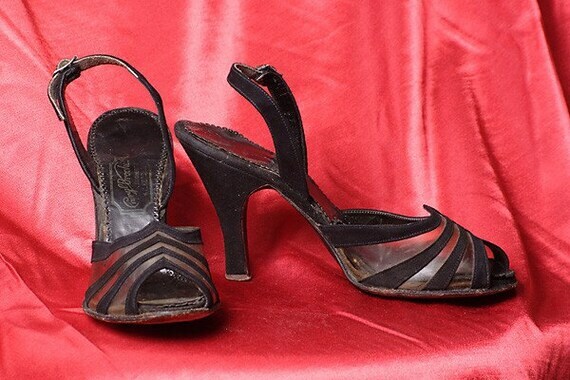 A single strap across the foot made them more secure than pumps, and chunky lowish heel had been common for several decades. Leather was rationed during the war so new shoes were made of fabric, mesh and raffia. Off duty women could wear sandals, pumps. wedges and peep-toe shoes, but these would not have been considered suitable for factory work. Of course some women would have worn boots, much like those worn by men in uniform. Check out etsy for great vintage 40s shoes, or go to Remix for an amazing range of vintage reproduction shoes to die for. Hello dear Cherry. I am a vintage wife too. What a lovely girl and great blog:-) Cheers from the heart of Europe! Thank you! I only just found your comment, and will visit you soon too. Your comments are very important to me and I read each and every one of them! Please leave your blog address so I can visit.